Smithsonian Article on The Lost Amazon - ARTE AMAZONIA provides a global voice through art for the indigenous cultures of the Amazon. photography with the "same precision as he did botany." Richard Evans Schultes, an explorer and botanist, spent much of his career penetrating remote reaches of the Amazon, where shamans taught him the healing properties of plants often unknown to science. In his pursuit of natural pharmacopeia, he imbibed strange brews and snorted potent snuff to personally test the effects, often donning traditional costume and participating in tribal ceremonies. By the time he died in 2001 at age 86, Schultes had documented 300 new species and cataloged the uses of 2,000 medicinal plants, from hallucinogenic vines to sources of the muscle relaxant curare. Schultes was also a popular Harvard professor, known as the father of ethnobotany for his groundbreaking work examining the relationship between cultures and plants. He inspired a generation of Harvard students to become leaders in botany and rain forest preservation—including Mark Plotkin, president of the Amazon Conservation Team and author of the best-selling Tales of a Shaman's Apprentice. "Here was a guy who went off to the unknown and not only lived to tell about it, he came back with all kinds of cool stuff," Plotkin says. Students remember Schultes' nonconformity; he was known to demonstrate the use of a blowgun by shooting at a target across the classroom. He was also an avid photographer, who recorded many remarkable images on his expeditions. But until recently, most of these remained in his files. Wade Davis, a National Geographic explorer-in-residence, unearthed the images while working on a biography of his former professor. Davis and photography editor Chris Murray collected and published many of the photographs for the first time in the 2004 book The Lost Amazon. An exhibition of Schultes' work is now at the Smithsonian's Museum of Natural History until October 31. Schultes used a rugged Rolleiflex twin-lens reflex camera and filed each negative in a labeled envelope with a small print affixed to the corner. Always pragmatic, he thought of his photographs mainly as a way to document the flora and culture of the areas he visited. Still, many of his portraits and landscapes have an artist's sensibility and are "raw and alive in a remarkable way," says Davis. 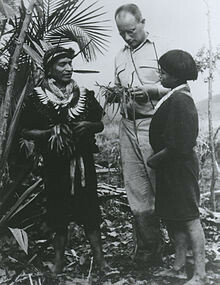 That may derive from the intimate relationships Schultes developed with the rain forest's inhabitants. While most outsiders before him treated the indigenous tribes with condescension that often culminated in violence, Schultes viewed them "as his mentors," says Davis. Or, as Plotkin explains it, "You don't get all these Indians to share their secrets unless you have some magic about you yourself."